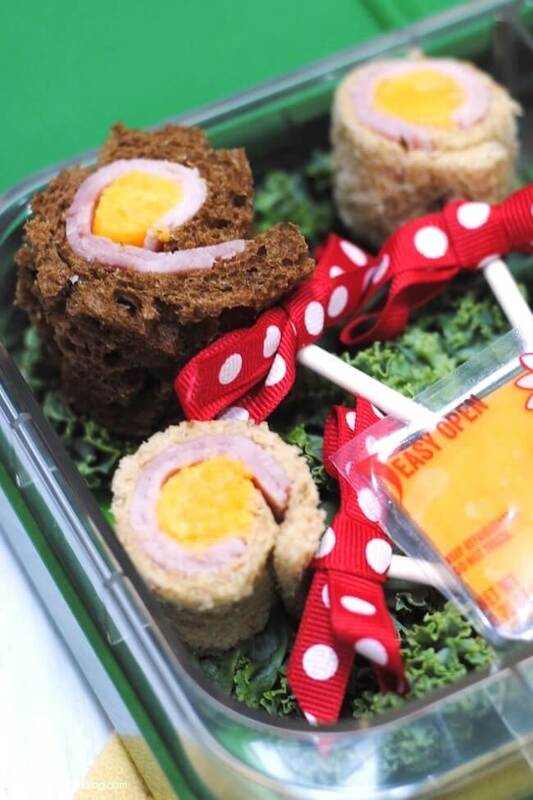 Sandwich lollipops put a special spin on the “usual” school lunch! Sponsored by Borden® Cheese. …and it was a total hit!! We pack our 5th grade daughter a lunch every day so we can ensure that she gets a balanced meal to fuel her brain and body for the rest of the afternoon. Like many parents, sandwiches are one of our go-to options because they’re easy! But the same ‘ole sandwich everyday tends to get a bit boring. 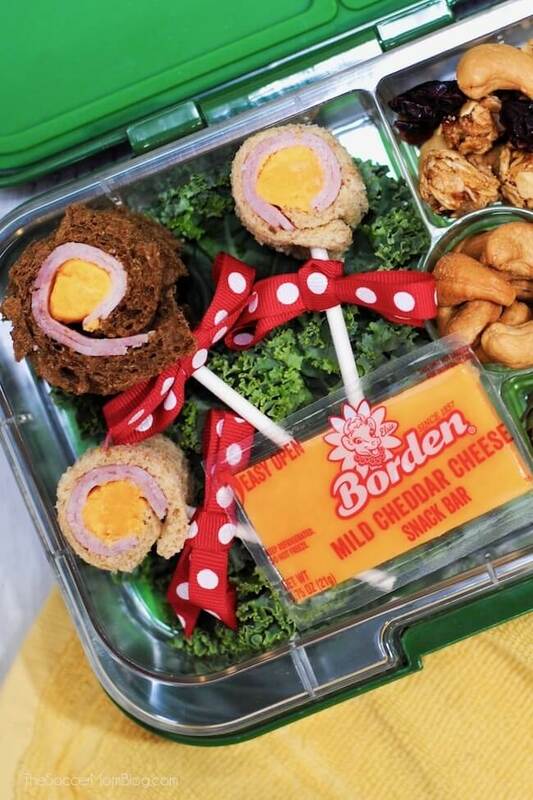 If you don’t have time to make the sandwich lollipops, grab a Borden® Cheese Snack Bar for a protein-packed snack on the go that will be sure to keep your kids fueled all day long! 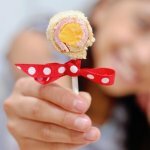 The best part about Sandwich Lollipops is that they really don’t take any more time to make than a regular sandwich! Keep reading to see how it’s done, then grab the free printable recipe at the bottom of the post. To start, cut the crust off one slice of bread so that it is square in shape. Stack two pieces of ham and trim into a square, slightly smaller than the piece of bread. Layer the ham on top of bread. 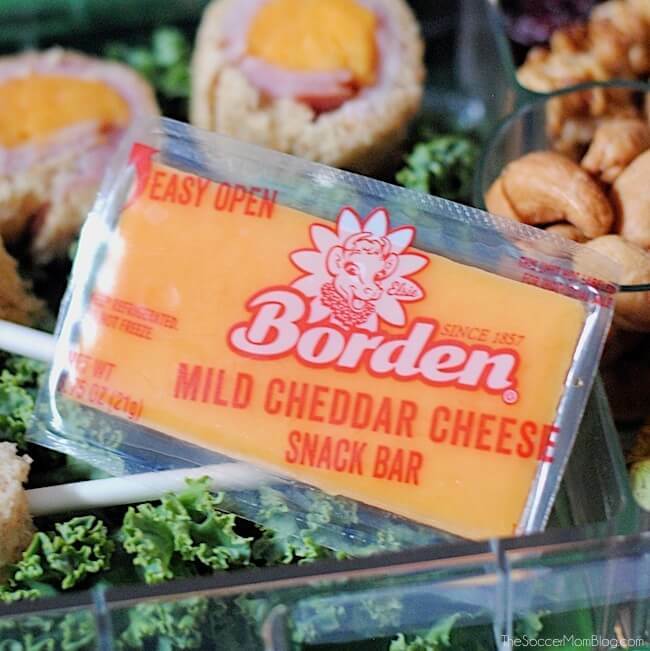 Cut one Borden® Cheese Snack Bar (we used Mild Cheddar) into two pieces, lengthwise. Place one half on top of the ham, along the edge of the bread. TIP: For an extra cheesy sandwich lollipop, use both pieces of cheese! Starting from the side with your cheese, roll bread inward, pressing slightly as you roll so it all holds together. 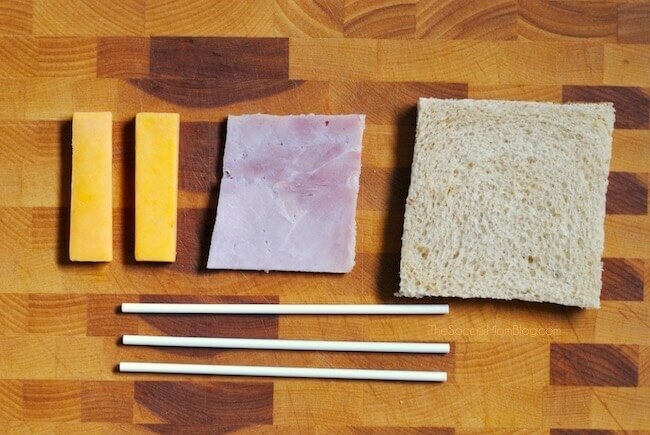 Cut your sandwich roll into 2-3 sections and secure each section with a toothpick or lollipop stick. Borden® Cheese adds a nutritious boost to school lunches and after school snacks! Plus, Borden® Cheese Snack Bars are conveniently sold in packs of individually-wrapped bars — perfect to grab and go if you’re in a hurry or simply want to add an extra dose of protein to your child’s lunch (we usually toss in an extra Borden® Cheese Snack Bar in addition to our sandwich lollipops). They come in four creamy, delicious flavors: Mild Cheddar, Colby Jack, Pepper Jack, and Gouda. For more information about Borden® Cheese products and where to purchase, visit BordenCheese.com. Be sure to connect with them on Facebook and Instagram too! Cut the crust off one slice of bread. 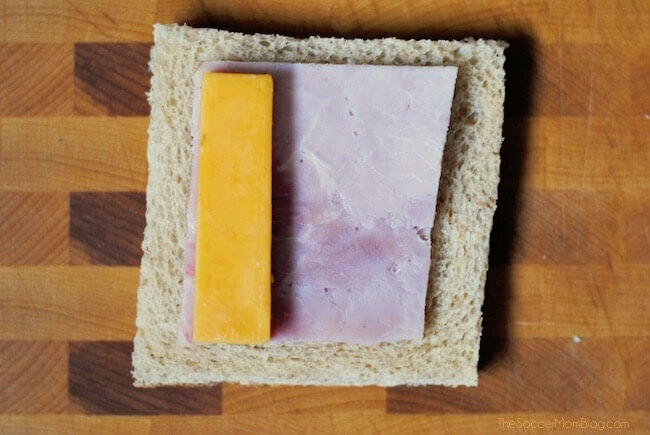 Cut one Borden® Cheese Snack Bar in half and place one half on top of the ham, along the edge of the bread. Starting from the side with your cheese, roll bread inward, pressing slightly as you roll so it will hold together. Cut into 2-3 sections and secure each section with a toothpick or lollipop stick. 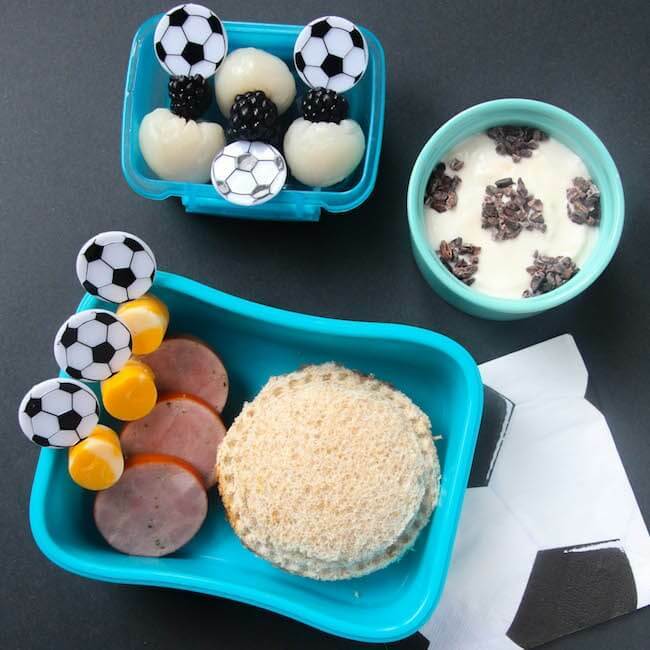 Borden® Cheese Snack Bars are also perfect for our Healthy Soccer Themed Lunch! These are super cute!!! I too send both my girls with lunches and sometimes it can get very boring… Question, where do you get your lunch container from?